Use these reading passages to help with common core standard ELACC24L1. These passages cover the who, what, when, where, why, and how questions when teaching key ideas and details. These passages can be used for whole group, individual work, centers, or as an assessment. A separate who, what, when, where, why, and how worksheet is included that can go along with any book being read in class. 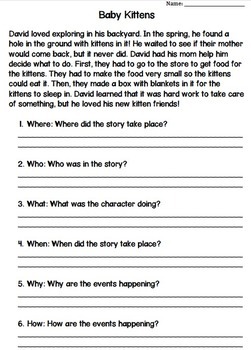 This is a great reading comprehension unit for students in first through third grade.